Editors Note: This article was first published in the Arts and Letters Segment of The Dhaka Tribune (Title sponsors of the Dhaka Literature Festival). Republished with permission of the newspaper and editor for The Luxembourg Review audience. 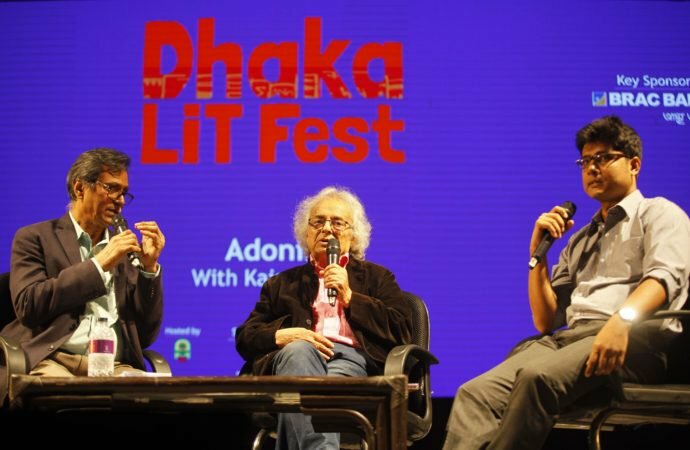 If you wish to read more on the Dhaka Literature Festival coverage, please visit their page by clicking here: Arts and Letters. Adonis is considered the greatest living poet in the Arabic world. 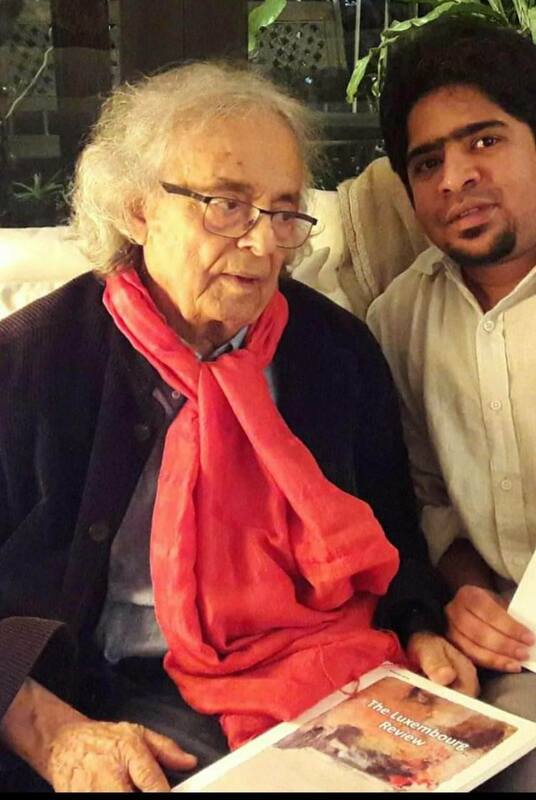 Kaiser Haq, the biggest Bangladeshi poet writing in English, engaged Adonis in an invigorating conversation about his poetry and thoughts about literature and the Middle East on the opening day of the Dhaka Lit Fest 2017 (November 16).Haq spoke in both English and French while Adonis replied in French. Kazi Ashraf Uddin, associate professor of English at Jahangirnagar University, joined the two poets and translated Adonis’s responses into English. The following is an excerpt from a transcription of that conversation. Note: Due to some technical glitches, the first two questions and Adonis’s responses to them could not be retrieved. In consultation with Kaiser Haq, we have decided to provide readers with a summary of the missed responses. The first question was about his name which originally was Ali Ahmad Said Esber. In response, Adonis explained why he adopted the name of a Greek divine figure. According to the mythological story, Adonis, the handsome young hunter, is killed by a boar. Shelley had turned this myth into a mythopoeic representation of the Romantic poet Keats “butchered” by critics. Ali Ahmad too saw himself as Adonis and the newspaper editors as boars that tried to destroy him. The second question was about his first collection of poetry that catapulted him as a prominent voice in Arabic literature. In response, he shared that after doing his mandatory military service in 1955-56 in the Syrian Army, he was imprisoned because of his political affiliation with an opposition party. On his release he and his recently wedded wife, Khalida Said, a literary critic, crossed over into Lebanon and settled in Beirut, where they devoted themselves full-time to literary activities. The first of Adonis’s 20 plus poetry collections appeared in 1957; soon he became the leading innovator in Arabic poetry, exploiting the resources of prose poetry to extend the thematic and emotional reach of poetry. – Editor of Dhaka Tribune- Arts and Letters. Kaiser Haq: Elaborate your ideas on the Arab world. Adonis: Religion has a strong influence on politics, so that’s why it’s been corrupted. Politics is corrupted these days. The best thing would be the separation between religion and the state. I propose a rereading of the Quranic text from a more secular perspective. At the same time, I believe that the reading should not be against religion but that religion should be an individual practice and it should not intervene in any other religious practices. The society should be based on three things: Human rights, liberation and liberty of women. The society or the individual attitude should not be based on religious confessions; rather, it should be based on secularism and at the same time civic sense. My poetry is a kind of rupture from the past tradition and it announces a kind of modernity in the Arabic world. It launches a new tradition. Before that many things were not allowed to be expressed. There was a kind of constraint on alternative thoughts. So, what I did was I created in my poetry a character, who worked as a kind of mouthpiece for the articulation of my thoughts. So, through literature I expressed my ideas. It was a kind of roundabout way that I invented myself. Through my intellectual, political and literary voice, I wanted to change the society. Kaiser Haq: You are a critic of your own society and religion. And at the same time historical events impacted you. You also responded powerfully to the debacle of 1967, the Israeli invasion of Lebanon in 1982. So, how did you create poetry out of this extreme experience of a war? Adonis: The Quran is not against creativity like poetry. However, in my society poetry and writing were creative output that was eyed with suspicion. So, I opened up a new journal and the purpose was to open up those creative faculties of different Arab people. And this journal gave us a chance to write poetry, to express our thoughts creatively. One of our main problems was reading. There was a project to reread all those texts from a different perspective and when one rereads a text out of a mediocre perspective, the text itself becomes mediocre. An importance was put on the culture of rereading our tradition and the literary texts emanating from it, and the meta-narrative as well. We should look at the poetic tradition from a new angle and we should reread the whole of our cultural tradition. What we found through our rereading was that the literature we liked was marginal due to its opposition to power. Literature connected to power was less important, less poetic and less creative. Marginal literature is more interesting and more vibrant. We had begun a movement and this movement gave us a new concept of the world: The first one was the conception of God and the second one was the conception of our cultural identity. We found out in the process that identity is not something we inherit from our generations; rather, identity is something that we create. So, there is some sort of existentialist connection here. My own self is not competing with itself, so I need other selves to communicate; I need other selves to enrich myself because my own self is the whole constituted of different other selves. Kaiser Haq: It is by now clear that you are interested in mysticism. You also say that Sufism and surrealism are similar in many aspects, and you have written a book on this. So, how do you think Sufism and surrealism are similar? Adonis: There is a debate about the relationship between poetry, national tradition and internationalism or globalisation. We have said that we want to be open to all other cultures and all other traditions. And what we also found that the very mysticism we find in surrealism existed 1000 or 1500 years back. The west is not the inventor of surrealism; rather, this kind of mystic tradition is something that goes beyond our nationality that has existed in the Arabic culture for centuries. The mystics used to believe that there was a reality beyond reality, and reality does not have to be something that is visual or visible. It can be something invisible. And that’s the connection between mysticism and surrealism. Kaiser Haq: Surrealism has had a connection with leftist politics. You also have had a long association with left politics. In fact, now you claim that you are a leftist. I would like to know how you define leftist politics today and how things have changed. Adonis: I believe humanity constitutes the essence of leftism. And this essence lies in change. Human beings are not a static entity. There should always be prospects for a change in the future. The future is basically constructed by human beings. Kaiser Haq: You said that the perfume of poetry should be able to combat the dark forces. What do you mean by that? Adonis: My poetry has its own force. For example, if we consider the door is rectangular, it’s a very simplistic and linear expression. But if we say that the door is like a woman who is opening her arms, then it gets some different meanings and different nuances. There is an interesting chemistry between the world, the word and the self. And there is also a kind of triangular connection between the world, the word and the self. It is important to me to create a world of images. The Arabic language is very corporeal. It has got some sensorial charm. So, it is always important to me to create a world of images through language, which I call “the world of images.” If we consider the whole world to be a flower, then we can consider poetry to be the perfume of that flower. Kaiser Haq: Do you think people are more interested in a flower than its perfume? Adonis: I think the American society and the American politics could be that flower we are always looking for. This is the flower of money, this is the flower of politics and this is the flower of power. The American politics distorts the smell of this flower. Kaiser Haq: The recent events in the Middle East have provoked sharp comments from you. Would you share your thoughts on that? Adonis: The Arab Spring opened up a new horizon for the Arab people. But at the same time, it was a kind of American creation the way they had created Osama Bin Laden. The Arab Spring has destroyed some of the Arab countries, such as Libya, Iraq and Lebanon. Kaiser Haq: In literary festivals, one topic that keeps coming up is the increasing difficulty of circulating literature and the declining readership and the declining reading habit in the younger generations. Adonis: I am not really worried about the new generations because they read more than readers of the previous generations. Different media that have emerged are helpful for facilitating the act of reading and also, the documentation process. to publish his poem in the next issue of the review.